The best way to honor a legend is an inspired update, rather than straight mimicry -- it showcases the honoree's continued vitality, and saves you from casting a hairy Englishman in the role of "Juliet". 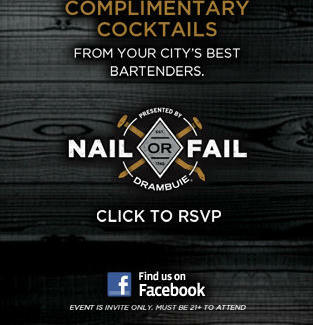 Now, you're invited as the city's top bartenders present their takes on one of history's most iconic cocktails, at the DRAMBUIE Nail or Fail. On 10/18 and 10/19, the best drink-doctors in Philadelphia will serve their takes on the 1950s lounge-king favorite, the Rusty Nail. The foundation of each creation will be DRAMBUIE, the blend of smooth heather honey, secret spices, and aged scotch whiskies that over 250 years ago was whisked out of Scotland by royal rebel Bonnie Prince Charlie under heavy pursuit from the English army (he eventually bequeathed the recipe to his loyal clansman -- disloyal clansmen got his stamp collection). The best part: because you're you, you get to judge who achieves the proper mix of originality and veneration, and who hits the Nail right on the...thumb. To take your rightful place at the event, sign up at us.DRAMBUIE.com -- because in your case, the best way to honor a legend is to show up and have a cocktail. Complimentary cocktails. And pool darts. And you. RSVP at us.DRAMBUIE.com. ENJOY OUR GOOD TASTE WITH YOUR GOOD JUDGEMENT.® us.DRAMBUIE.com ©2010 DRAMBUIE IS A REGISTERED trademark of THE DRAMBUIE LIQUEUR COMPANY LIMITED, EDINBURGH, SCOTLAND. Imported by DRAMBUIE IMPORT COMPANY, CORAL GABLES, FL. LIQUEUR - 40% ALC. BY VOL.